And in a way we are. Next week 1500 motorbike riders come to Austria to take part in the Erzberg Rodeo, the toughest single day off-road motorbike race in the world. Not only are the Media House covering it, but also the main event on Sunday will be broadcast live for five hours. Goody! The amount of prep being done is staggering. Media House don't do things by half measures, but covering a race live that takes place over a mountain is one of the bigger challenges we have every. Erzberg has to be seen to be believed. 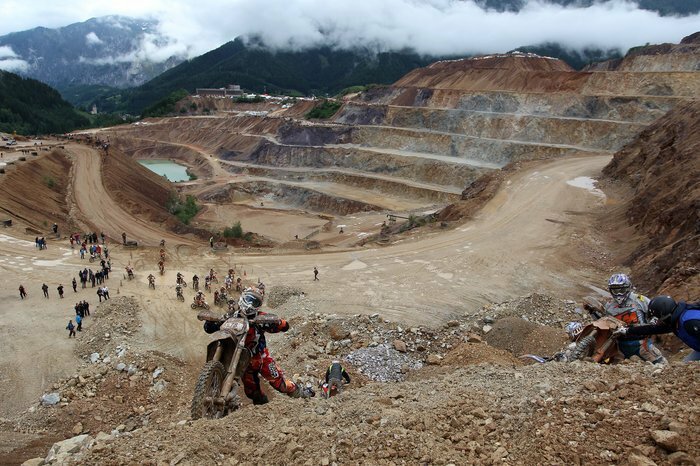 It takes place on an active iron mine, and makes you re-consider the definition of the term gnarly. More or less anyone who is anyone in the world of off road enduro biking will be there - Taddy Blazusiak will be leading the charge this year again - he's after a sixth, and what many expect, final title. You may even see my big face doing some field reporting - I can apologize for any trauma this may cause if that is the case. In other news we recently helped shoot Sebastien Loeb's final training days in Europe on Mont Ventoux as Pikes Peak gets ever closer- expect to see a video of that next week. And a big shout to the RB Racing boys in Monte Carlo - best of luck... Personally I would love to see Mark complete a hat-trick of wins there.